Fur hasn’t only soared in the fashion world, it has also taken the world of décor to a whole other level. With the same elements of fashion included – comfortable and stylish – whether it be chic and modern, or an old styled rustic space – fur can be incorporated in every way possible to assemble the perfect interior style. As we move (slowly) into winter, it’s time to share some of the best faux fur pieces for the upcoming season. 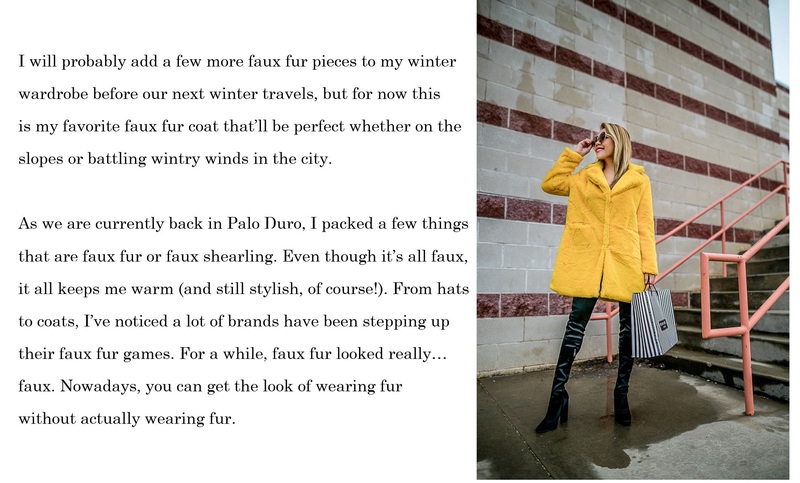 For those who have been following my blog since the beginning, you’ll know there are two things I do not wear: real fur. You’ll rarely see me in cheetah or zebra or any other animal print because I don’t think that kind of look suits me that much, but you’ll never see me in real fur because I don’t support it. Instead, I find the best of the best in faux fur for cooler weather, from accessories to boots to coats. Get this fur coat from Amazon Fashion. I highly recommend! I am still thanking my fur garments for keeping me warm during the bone chilling temperatures we experienced this last winter. Fur remained a fashion staple in Texas this past fashion season and is growing in popularity. Warmth Doesn’t Always Mean Fur Love: Temperature matters when it comes to keeping your furs lustrous and supple. Keeping your furs in an environment that’s too warm or moist can cause damage; too cold temps can be drying and result in brittleness. treat your fur coat with extra care. Sew That Fur: Now is the time to care for your fur, get any loose seams or rips repaired. This fur care will prevent minor problems from becoming more expensive, major problems. Get Creative With Fur: During the fur off season, why not get your creative juices flowing and think of restyling or remodeling the fur jacket or coat you aren’t wearing. Revamping an old fur coat is a wise investment as you’ll have a new fur piece with breaking the bank. What a better way to update your look for the coming season than by giving a quick style tweak to your much loved old fur. A simple silhouette shift, nip or tuck, allows you to create a fur style that fits your lifestyle. You say love your furs, so treat them like you mean it! Thank you so much for stopping by. Have a wonderful week y’all! Next Post Instagram outfit roundup featuring a bunch of easy fall looks! Great outfits as always babe, Loving how you styled this coat in the second look ! So chic!! Great outfit! Amazon has some great finds. This is so beautiful. This pic is solid gold! ✨You’re so inspirational! This is so beautiful. This pic is solid gold! You’re so inspirational! Whoaaa that yellow jacket is giving me LIFE! Love, love love! I do think this is one trend that will go on forever. Every woman can have fun with it, and especially with the bright colors!! Love a good faux fur coat! I love this coat – it looks amazing on you and what a bargain! And thank you for the care tips, too. That is such a gorgeous coat, love the color! OMG I love this look so much! Especially this coat! 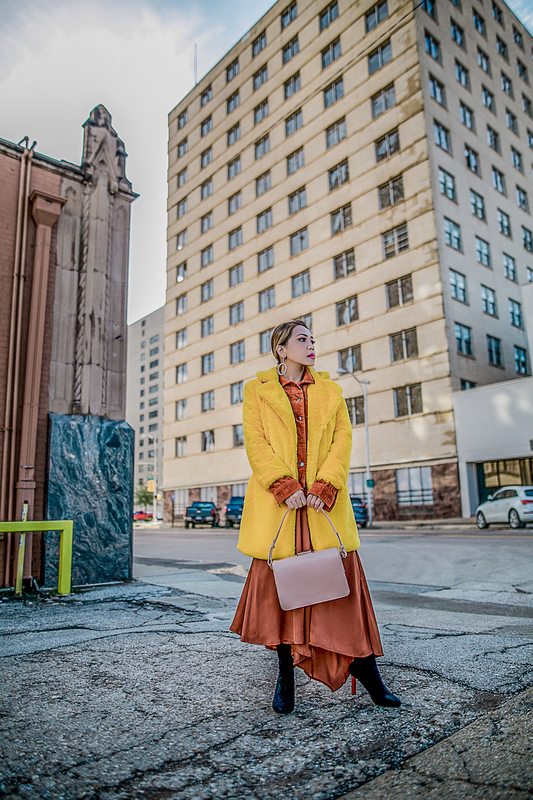 Love the bold color of this coat Len! Faux fur is so perfect for the season. Thanks for these picks. the yellow faux fur look really great on you. Been desperately looking for a new faux fur coat before all my winter trips. I don’t support real fur either so hoping a lot of brands step up their faux fur game as well. Lovely coat you have there dear! Super cozy and warm, really perfect for the season. Such a fun color too! I really love faux fur.Your yellow coat is amazing. This coat is stunning!! The color looks amazing on you! I am all about faux fur right now, too! These are great tips babe. 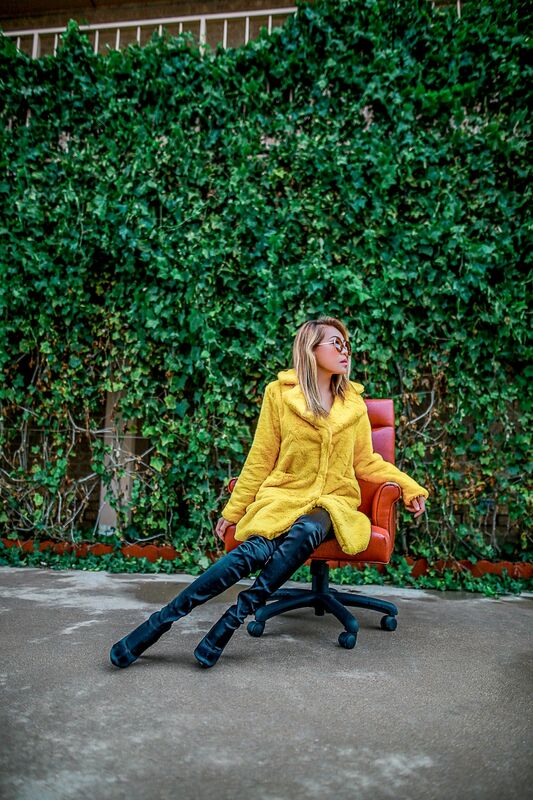 The yellow coat really suits you! Have an amazing weekend Len! Fur indeed has multiple benefits and advantages. That fur coat is a head turner. You look gorgeous. So so cute!!! I loveeeeee these shoes 🖤 What type of camera/ lens was used to take this shot? Gorgeous, Len! That coat is fabulous on you!